As a member of McLeod County since 1994 our goals for 2019 are that we continue to provide families with safe, decent and affordable homes within our county. In order for us to accomplish this we need your support. We not only need volunteers to help us when building, we need people to join in our efforts to gain support for our mission. 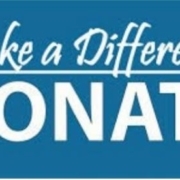 Consider becoming a board member or how about simply becoming an advocate for CRHFH and help us to find families in need of affordable housing as well as engaging members of our community to become involved in our mission. Keep in mind in order for us to help others we need to raise funds so we can build homes and we need the support of our community to make this happen. Our vision is clear and with the support of others we will succeed. Help families with affordable housing needs within our county. Expand our number of volunteer’s, including partnerships with area businesses to volunteer. Engage more members of our community to be apart of our mission. Raise funds to build and/or renovate homes within our county. Acquire affordable land in which to build or property to renovate within our county. Help to support and engage others to be apart of building a stronger community in which we live. Join us in our mission, by becoming involved in helping us to achieve our goals and giving others an opportunity to achieve theirs. We are on our final days of our build and could really use some light lunches for our volunteers. We are looking for lunches on Thursday 13th and Friday 14th and Mon.-Thurs. of next week. Lunch is served each day by 11:30 and usually we have 6-8 persons. If you are able to help please give us a call 320-587-8868. With your help we have built 26 Habitat homes. In order for Habitat to continue to be a vital part of McLeod County we need to raise funds, although the partner families pay mortgages, we still pay for the home upfront the year that it is built. We also need volunteers to help build, provide lunches to our volunteers and we are seeking persons to join our board and our leadership committees. Habitat homes are more than buildings; they serve a family’s foundation and a doorway to stability and self-reliance. Your gift will empower Habitat to impact families in McLeod county and worldwide to help build a place they can call home. 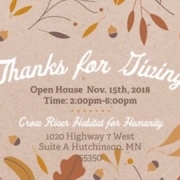 YOU CAN BE A PART OF CROW RIVER HABITAT FOR HUMANITY WITH YOUR GENEROUS GIFT! Please join us in appreciation for our many volunteers, supporters and donors. This is just a small way for us to show our thankfulness to our supporters. We will be serving light appetizers, sweet treats and hot cider.